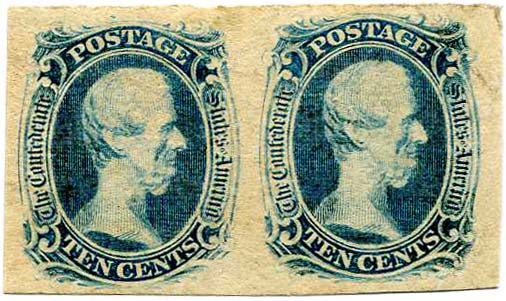 CSA 9, 10¢ blue "T-E-N" PAIR, part original gum, pressed out corner crease at upper right, vertical pressed creases on left stamp (not mentioned on cert) and tiny surface scrape at upper left. 2005 CSA Certificate 04669, SCV $2,000. $950. 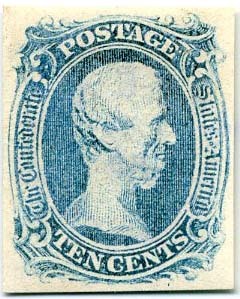 CSA 9, 10¢ blue "T-E-N" SPERATI FORGERY, Type B, stamped “counterfeit” in red and signed by Sperati, Ex Powell and Katz. 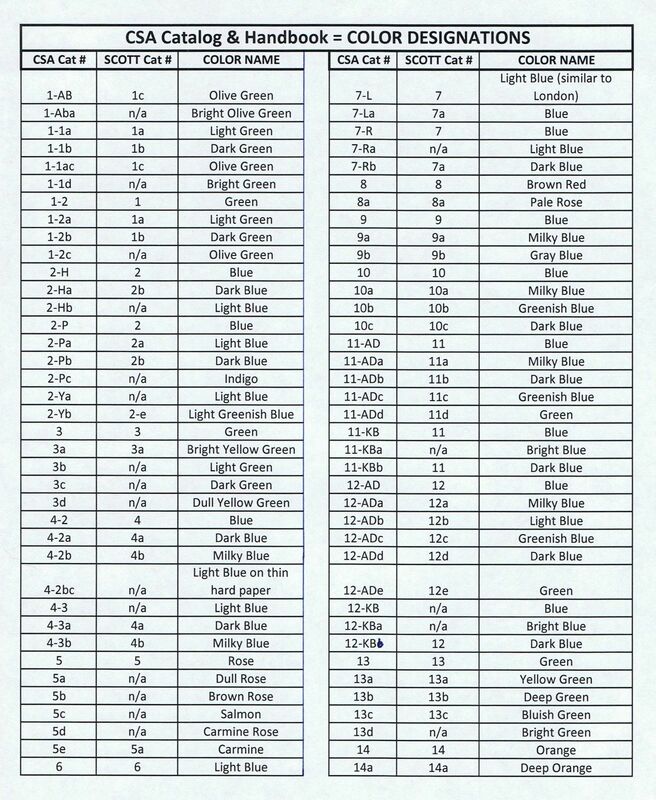 See Confederate Stamp Primer Trouble Spots – CSA 9 for type differences. $450. Jean de Sperati was one of the most noted and proficient stamp forgers in the world. His stamps were often authenticated as genuine by experts. He was a printer by profession and could skillfully mimic with detailed accuracy the design and motifs as well as the paper of the real thing. He was nicknamed "The Rubens of Philately." 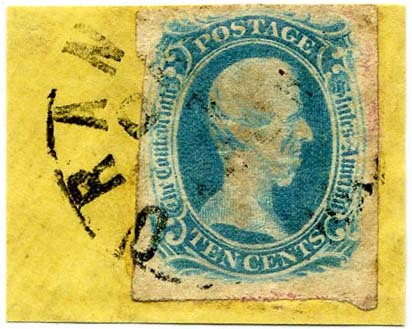 Forgeries by Sperati often command prices equal to the genuine stamps. 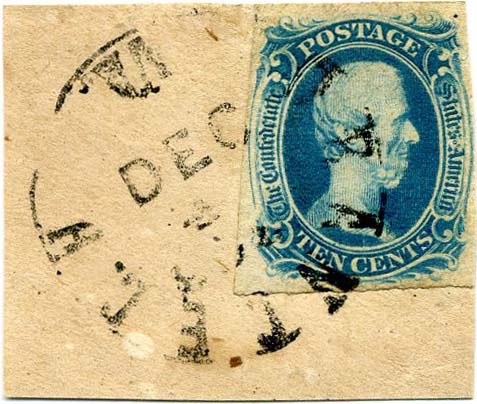 CSA 9, 10¢ blue "T-E-N" SPERATI FORGERY, Type A, stamped “SPERATI REPRODUCTION” in purple with #138 at center in pen, see Confederate Stamp Primer Trouble Spots – CSA 9 for type differences. Very Fine. $400. 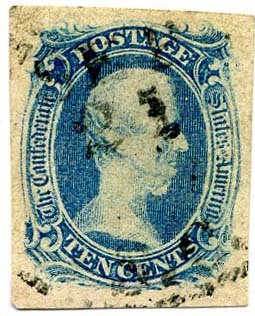 CSA 9a, 10¢ milky blue T-E-N used with unidentified town postmark, light soiling, pressed creases and tiny pinhole, 4 huge margins all around, SCV $550. $400. 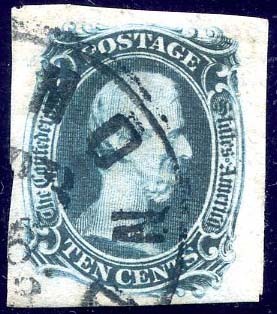 CSA 9, 10¢ blue "T-E-N" with used with RICHMOND cds, enormous margins all around, Very Fine+, Ex Hardy, Emerson, Ashbrook, Wyche and Kilbourne. $750. 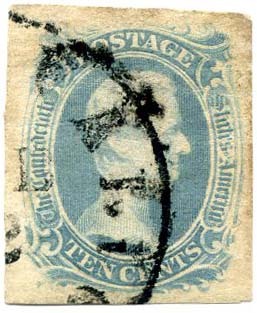 CSA 9, 10¢ blue T-E-N, 4 even margins, tied on piece by ORANGE C.H. / VA. cds, SCV $500. $500. CSA 9a, 10¢ milky blue T-E-N, 4 margins, tied on piece by ORANGE C.H. / VA. cds, Ex Powell and signed by him, SCV $550. $450. 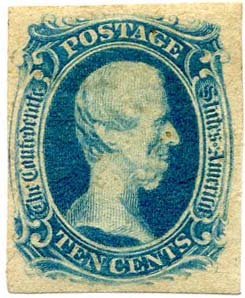 CSA 9a, 10¢ milky blue T-E-N, unused, no gum, fresh but for couple tiny tone specks, Fine-Very Fine, SCV $1,000. $700.